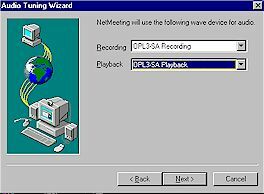 Installing Microsoft NetMeeting 3.01. Please follow these steps. Please note: If you are using Windows XP you already have NetMeeting installed. 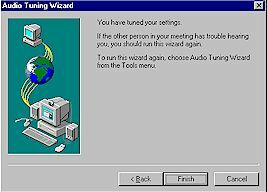 Go to C:\Program Files\NetMeeting and double-click on the conf.exe file there; that will install NetMeeting. If conf.exe does not yet exist on your computer please install NetMeeting from your Windows XP CD-ROM - the version of NetMeeting available below will not install on Windows XP. When it asks you "Open [or run] this file from its current location" or "Save to disk", choose "Save this file from its current location" and remember where you are saving it onto your hard disk. When it has finished downloading onto your hard-drive, find the file again (it will be called nm301.exe) and double-click on it. When it asks you if you want to install NetMeeting answer "Yes", then click on "Next" or "Finish" to all of the questions. When this has finished, start NetMeeting. You can do this by going to "Start" (in the bottom left-hand corner of your screen), then "Programs". NetMeeting should appear in the list of programs on your computer. This means you are finished, and are now ready to use NetMeeting. Click on "Finish", and NetMeeting will start.You are now ready to call our reception or join our chat area. To do so, please click here.